The 370Z isn’t the best selling car from Nissan, and in fact it is often overlooked compared to other cars available now, including those made by Nissan itself. But a closer look shows the 370Z is pretty good as the 2019 model has several improvements and even the base model offers excellent value. It’s 2019 and the 11th year of the Z line, and the 370 is being touted as the successor to the 350Z which came out in 2009. At first glance the 370Z doesn’t seem to offer much and looks a lot like the model it replaced. But this rear wheel, 332 hp car has decent specs given that it only costs $30,000 or so. The current Z line also offers the Heritage Edition for the base edition. This package – which costs around $780 to $800 – adds yellow leather accents on the center console, shifter and steering wheel. The interior is enhanced with yellow stitching too. The package also includes glossy black exterior graphics and black outside mirrors. The Heritage comes in black, blue and yellow. You can also equip the base model with a floor mat package. All of these enhancements do complement the built of the car. Speaking of built it also comes with a 6 speed manual transmission. Even if you add these enhancements the 370Z is still going to cost less than other cars in this range. Not only is the 370Z more affordable but it packs more power too. The chassis has been reinforced by a strut tower, 3 point brace. The cargo area has a bar for reinforcement too. What this means is the car rides smoothly even on rugged terrain. The 370Z has 55.2% of its 3300 lbs on the front tires but the balance is still good. The suspension is good for this type of cars though it’s smoother at lower speed. The wheelbase is small compared to others and there is no significant effect on performance. The grip is also good and should be able to withstand long hours on the road. The highlight here is definitely the V6, and it outclasses competitors like thee MX-5 Miata RF. The 370Z reaches 60 mph in 5 seconds and speeds through a quarter mile in 13.6. The car is able to do that by reaching speeds up to 106 mph. That makes the 370Z faster than other cars in this range. Acceleration is better than previous versions as is the engine. The Z line has been using aluminum-block, DOHC V-6s since the early 2000s as have Nissan sedans, SUVs and pickups. In this edition the 370Z has a 7500 RPM, 11.0:1 compression ratio and 3.7 liter displacement. The power maxes out at 7000 and produces 270 lb ft of torque at 5200 RPM. The 370Z gives you lots of torque from the get go so driving around is easy. Depending on how you want to drive you can make it on third or second gear. With its 6 speed you’ve got a versatile ride thanks to the tight ratio and short gear. Passing on the streets or highways rarely if ever need downshift. If you’re going at 80 mph on the highway the engine keeps moving along at 3000 RPM. In other words the 370Z is going to keep going at high speeds as long as you want. There is a bit of vibration on the clutch pedal and shifter but these are not deal breakers. The vibrations are also felt only when the car is at a high rpm. The shifter stroke could be lighter but it does work. Both the shifter and clutch feel a bit rubbery but they do respond to your movements. The steering is very responsive and easier to manage than the shifter. Response is so good that sometimes it feels too sensitive. Even with just one hand you’ll have no trouble steering the car where you want to go. 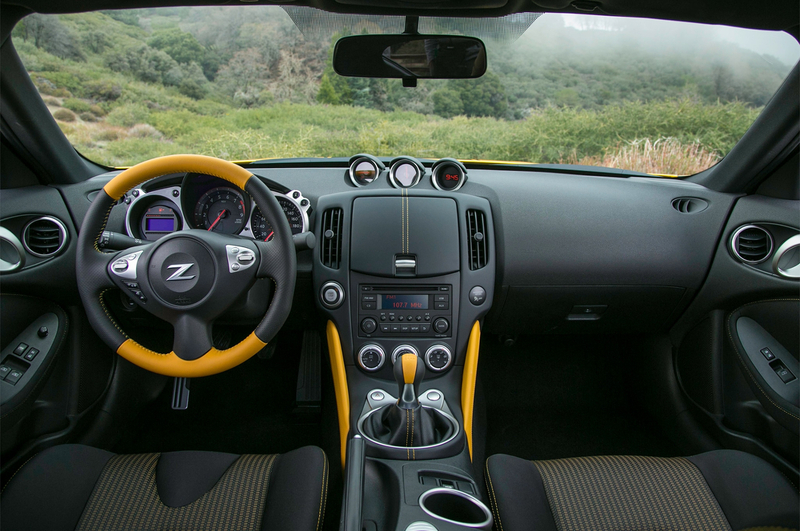 The 370Z electronics are well designed and intuitive. At the center of the gauge cluster is the tachometer, pretty much where it will be on a sports car. A gauge for oil temperature is included which is rare for today’s models. It also has a shift light that begins flashing red when the rpm hits 7000. The pedal is well positioned and makes downshifting easy. The interior is well organized. The seats are comfortable though some extra thigh support for the thighs could have helped. The 370Z base edition isn’t exactly stacked with features but s mentioned earlier there are packages available to enhance it. The 370Z has come a long way and it really should not be glossed over. With its sports car design, solid construction and V6 engine, the 370Z offers superior performance, built to last and of high quality.